Because I'm so worldly and wise when it comes to football, I can tell you of a little known striker over in Brazil currently courting interest from clubs all over the globe, specifically Barcelona. 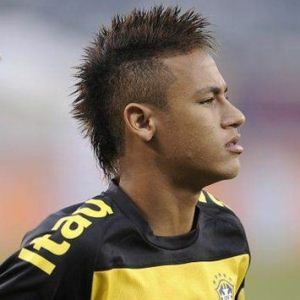 His name is Neymar. Or Eeyore. One of the two. "I've always kept Ronaldinho's adivice in mind. He spoke wonders of Barcelona and the city, which he says is marvellous." Conclusive proof then that he wants to play for Barcelona. Other "proof" comes from reports that say the Catalan giants have already made a payment of £10million to secure his services in 2014 when they will pay an extra £50million, which is nearly £80million but not quite. It's actually nearer £60million. The Brazilian star has turned down Chelsea because, well it's Chelsea I suppose, and this means I can't wait to see Neymar and Messi combine on the pitch to fight the alien invasion we expect in that same year. Jeff Goldblum's getting pretty old now and it's time for young blood to come through and do stepovers since that is the secret to defeating them, as is the conclusion I have drawn from my study on space mutant Gabriel Obertan's paranormally haunted face.